Once in a while, the Universe gives us precisely what we need – slow days. It’s absolutely incredible to feel like you’ve got all the time in the world, but it’s just so bad that it rarely occurs! Many of us get caught up in the busyness of daily life, our minds becoming an endless to-do list. So when we finally have slow days, we don’t often know what to do with our time. 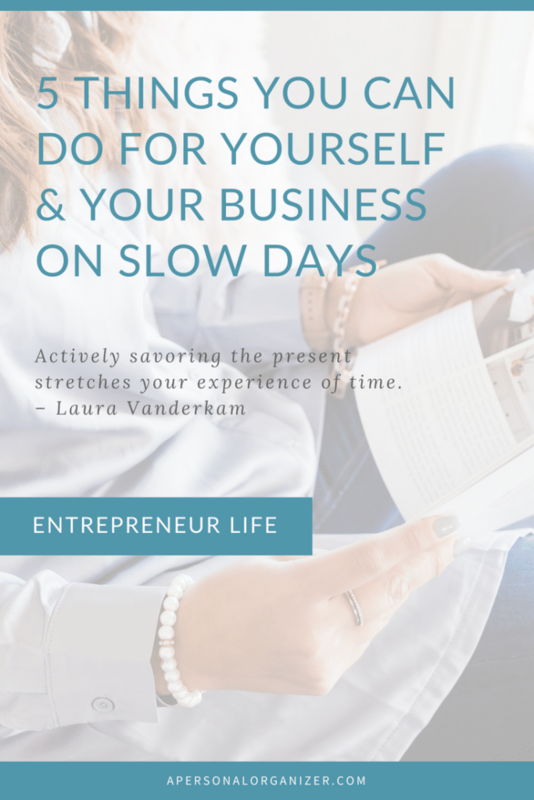 For those of us who are juggling the role of busy parent and of a small business owner, slow days are hard to come by, but when they do happen, being wise on how we spend them is good for our well-being and our business. 5 things you can do for yourself and your business on slow days. There are affiliate links on this post and I may receive a commission at no cost to you if you decide to use them. There’s an interesting concept that I think we should incorporate into our slow days – savoring. I think the concept of holding yourself where you are is a beautiful one. Because you have less on your plate on slow days, your brain is less cluttered, allowing you to focus better and think better. Of course, when you have mental clarity, ideas can come flowing freely. This got me thinking — what if I could use that time to focus and figure out the right direction for my organizing business? When it is a bit slower than usual, I could refine my business processes and work on things that I have been too busy to do. I’ve tried it, and I’ve found that on slow days, you actually are able to really think through processes a bit better, hence, make changes where necessary. This may sound contrary to your idea of slowing down, but if you ask me, this is actually THE best time to review and “audit” your business. When you have some downtime and do not feel rushed, you can actually take the time to sit down and take a look at how your business is doing. How far have you come? What are some areas to improve on? How can you take your business to the next level? Are there things you can automate to make your job easier? When you have the mental clarity to do this, you’ll find that you will be able to accomplish much in a shorter amount of time. Clear your desk — clear your mind. Turn a slow day into a very productive day by clearing your desk. It can be very liberating! Taking just a few minutes to organize your workspace thoroughly is usually enough to maximize productivity. Get rid of anything lying around that you don’t use on a daily basis. While you’re at it, reorganize and streamline your workflow. A clean desk will help you work with a clearer mind when the work picks up again. Discover Pocket – and use it on slow days. If you haven’t heard of Pocket yet – you’re in for a treat! Pocket allows you to save articles, videos and more for later reading easily. When you work at home, it’s easy to get lost in your daily routines – emails that need replying to, kids that need your attention, food that needs to be packed, and so on and so forth. On your slow days, use the app to get back to those articles or videos you’ve been wanting to read/watch. After you’re done reading, Pocket allows you to send the articles and videos you love to another friend’s Pocket or share to Facebook, Twitter, Evernote, or email. It’s pretty neat! Get inspired by a podcast. Say you’re a cubicle dweller, a work-at-home mom or just someone like me who drives in traffic to go to clients, podcasts are a great way to get through a slow day. I know some people who have actually made listening to podcasts a part of their daily routine. The great thing is, you can listen while traveling, commuting, working, cooking, cleaning, and sometimes even while showering! What inspires you? What are you passionate about? Chances are you will find a podcast that will truly inspire you. Check out several podcasts today and stay educated and informed on your slow days. Make it a Spa or Salon Day. Now that you finally have some time for yourself, why not reward yourself for all your hard work? If slow days for you are all about taking care of yourself and not doing anything related to your business, then by all means, enjoy your day. Alone or with girlfriends, slow days provide an opportunity for you to finally have that luxurious massage or facial you have been dreaming about, or get that hair color you’ve always wanted! Today, more than ever, having Me time is essential to our well-being, so take advantage of slow days to rest, recharge and rejuvenate. You’ll come out feeling ready to take on the world! What do you do on slow days? Let me know by leaving a comment below.